This is an example of the Lavenderia font and the Butterfly Flowers design. 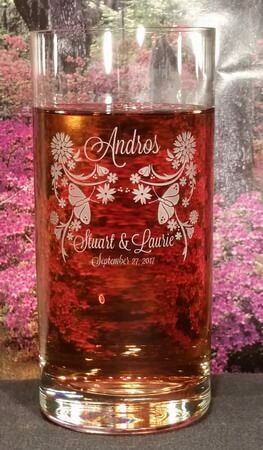 Note: design has been mirrored on sample glass, if you'd like it like this just let us know. Made in Europe from brilliant lead-free crystal, this highball glass contains trace amounts of titanium for added brilliance and strength. A favorite of many world-class sommeliers and chefs.